We have done articles before on all of the tools that you should have in your home garage, whether you are an expert mechanic or not. We all need tools from time to time that help us to get out of a bind or get us back on the road. Some of the tools listed here will do just that, while others are important for the safety of you, your passengers, and even other drivers out on the road, should something go wrong. You can get many of these items at LaCava Auto Parts and Service in Fall River. We have been providing top quality car parts and accessories, along with tools and services, for over 70 years. In fact, in most cases, if we don’t have the items you need in stock, we can still get it for you at our local auto parts store. This tiny little tool is literally a lifesaver. Read the instructions on how to strategically place it in your vehicle near the driver’s seat where it can be accessed in an emergency. This tool can help you to break a window if you get trapped inside your car. It can also be used to cut your seat belt in an emergency, something that most people don’t realize tightens and refuses to disengage in an accident. If your car flips upside down, you end up in rushing water, or find yourself in any other tight spot, the Life Hammer will be your best friend. Even if you have a brand new vehicle, it’s a good idea to carry jumper cables around with you in the trunk, just in case. You might not just help yourself, but could help another stranded driver who needs assistance. 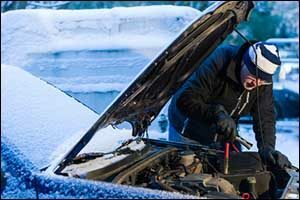 While there are “starter” tools that plug into the 12-volt outlet of your vehicle that some people swear by, it is still important to have a traditional set of heavy-duty jumper cables with the spring-loaded clamps that are designed to work with just about any type of car or truck. You never know who you might be helping or who might be helping you get back on the road. This is a tool that you should definitely know how to use and get a lot of practice using. In fact, experts recommend that you test your tire pressure weekly. Even if your vehicle has one of those nifty built-in pressure monitor systems, you should at least double-check the reading on a regular basis, especially during inclement weather and before going on a big trip. Remember that tire pressure needs will change during different seasons, so read up on the inflation requirements of the brand and model of tires that you have to maximize the longevity and performance of this important investment in safety. Do you have a spare tire for your vehicle? Even if you do, when is the last time you checked the spare to make sure it was properly inflated? There’s nothing quite like getting a flat tire, changing it out to the spare, then only to have the spare fail as well because it wasn’t properly maintained and protected. Purchasing a can of tire inflator and sealer at LaCava Auto Parts can be a lifesaver if you get in a tough bind. There are also situations where changing the tire does not make sense, due to bad weather, road conditions, or location. All you need to do is hook it up to the valve stem of the tire – you don’t need to find the nail, tear or hole in the tire. The material goes inside the tire to find the leak and fill it up with the right amount of pressure to allow you to get to the closest tire shop. This is a one-time, short-term solution, but it can be just what you need to get you and your family to safety. No matter what you are doing or where you are going, this is the one tool you need to get from your local auto parts store. A socket and screwdriver set can help you install a wide range of car parts and accessories, tighten up something that has come loose, switch out a dead battery, and get you back on the road. Even if you don’t know what you are doing under the hood, a socket and screwdriver set can help make enough of a difference to at least get you to a proper mechanic. LaCava Auto Parts has lots of tool kits, automotive parts, and service in Fall River designed to help car owners keep their vehicles in good running order. You will also want to get emergency items, such as an emergency roadside kit, duct tape, a tow strap, a flashlight, and a knife. In the winter months, New England drivers should also have a winter safety kit that includes a wool or mylar blanket in case you are stranded without heat, as well as a snow and ice scraper, tire chains, and a portable foldable shovel for digging out of snow and ice. 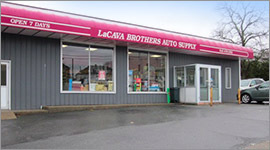 Visit LaCava Auto Parts in Fall River to take a look at all of the supplies, parts, tools, and accessories at our South Coast auto parts store. Give us a call at 508-676-1951 or stop by our location on Bedford Street to take a look at our wide selection of automotive parts and services in Fall River, Massachusetts.